Orgone is the name given to Life Force, Chi, Qi, Etheric Energy, or bio-energy by Wilhelm Reich in the 1930s. Orgone is a type of energy that defies many of the laws of Newtonian physics and is considered to be the energy that creates and heals life. Each of our Orgone Energy Field pieces are powerful spiritual tools that can be used to enhance all areas of life–physically, mentally, emotionally, and spiritually. What is the purpose of Orgonite? Orgonite has several purposes for people and pets. It helps to transform lower vibrational energy, also known as negative energy, into a higher vibrational energy. 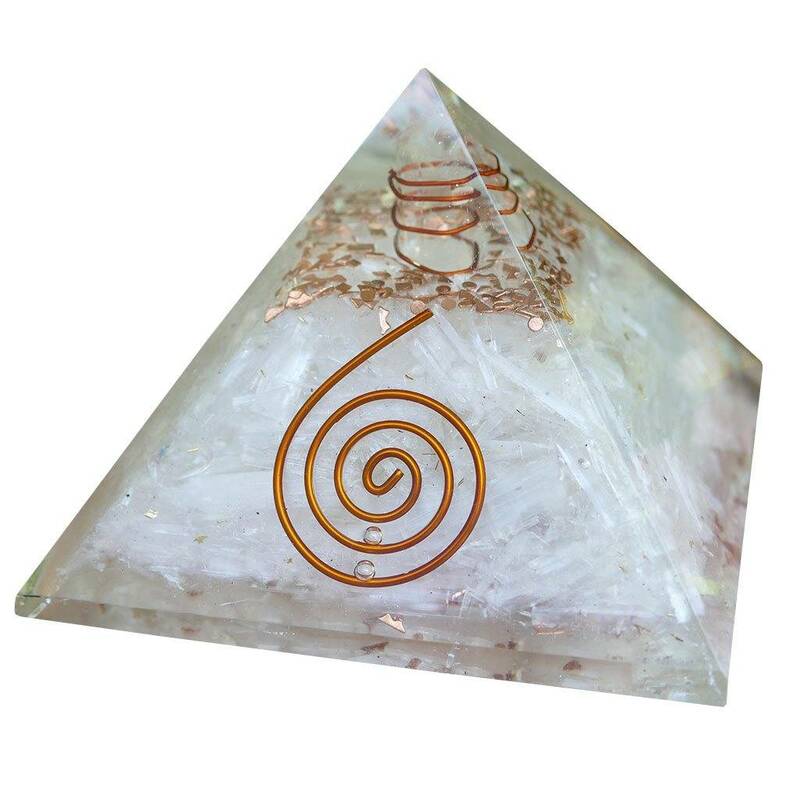 When you wear, hold, or stand near a piece of orgonite, the orgone device will clear negative energy from your field, creating a balanced and healthy state. It can clear negativity from your surroundings as well as from your being. It is often used for protection from wireless devices as well. Orgonite is a series of metal shavings, gems, stones, crystals, and wires that are arranged to protect our frequency and auric field. These items are held together with apoxy that makes them wearable, or can hold a form to place on a shelf to protect your home from the electromagnetic pollution that has inundated our world. We are honored to carry pieces from Orgone Energy Fields, who diligently hand select each item for every individual piece. The owner of Orgone Energy Fields, Gary Fields, is also a Reiki Master and infuses each piece with Reiki (a Japanese technique for stress reduction and relaxation that also promotes healing) for added protection. What I love about Gary’s work is that each piece is unique and individual just like each of us. One piece may speak to you more than another. It’s not that one piece is better than another, but we may be attracted to one piece because that is the one that connects with us energetically. Each gem, stone, and crystal have healing properties that support our body. Why should I use Orgonite? At this point in the game, we all have something wireless, deal with daily stressors (life, job, commute, family, etc. ), negative environments or negative people. It’s just about impossible for you to avoid it in the world we live in. Even if you avoid it, you are still affected. Our neighbors have wireless connection and even some cities have it citywide for their residences. Our family and friends are all unique in their own ways and personalities that may affect us and our pets individually. The gadgets you are purchasing for your home may have wireless connectivity. That may include your fridge, toaster, television, light fixtures–you name it. With that being said, we are all energetic beings and our energetic field oftentimes gets disrupted by the wireless waves that are constantly bouncing off the walls, other inanimate objects, and our human body. And don’t forget your cat and dog, too! When should you use Orgonite? In my opinion, you should use it every day. Our wireless technology is becoming more advanced, which means it can play a more dangerous role in our physical health. If you experience lack of sleep, cases of negativity, feeling depressed, brain fog, headaches, migraines, unexplainable aches and pains, lack of concentration, or irritability, you may be sensitive to the electromagnetic fields. Even though our cats and dogs can’t talk to us, we can often recognize when they have sensitivities as well or at the very least when they don’t feel well. When pets are sensitive to weather changes, car rides, loud noises, reactive with other animals or people, avoid the room where your modem is located, can’t handle environmental changes, and the list goes on, then you may want to try orgonite. I would also consider orgonite if life is stressful, you are surrounded by negative people, you live near a cell tower or large power lines, or if you simply just want balance. Stop in our store to find out more about the benefits of orgonite and to check out our line of Orgone Energy Fields products.